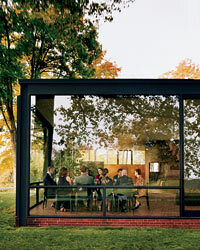 Editor in Chief Dana Cowin invited nine visionaries to an anniversary dinner in architect Philip Johnson’s iconic Glass House. We believe that these tastemakers will continue to shape the culinary consciousness of our country for the next 30 years. Since Dana Cowin became Food & Wine’s editor in 1995, the magazine has featured many of the most talented people in the fields of food, wine and design. The guests she invited to our 30th-anniversary party have already changed our world in big and small ways, and Dana sees in each the potential to do even more. “It was amazing to be with these terrifically innovative people at the Glass House, and to participate in a stimulating exchange of ideas,” she says. At his boutique Thompson Hotels, Jason Pomeranc has hit upon the future of hospitality: a blend of chic guest rooms, distinctive restaurants and fashionable nightlife, tucked into quiet city streets. The 97-room 60 Thompson, opened in 2001 in Manhattan’s Soho, houses a swanky Thai dining room and an exclusive rooftop lounge. By 2009, Pomeranc will have 10 hotels, including Thompson LES in New York City, with a global-Asian restaurant from Toronto star chef Susur Lee. Maricel Presilla has done more than almost anyone to introduce the U.S. to Latin American flavors. In addition to her restaurants—Zafra and Cucharamama in Hoboken, New Jersey—she has a website, ultramarinos.biz, which sells equipment and food, and her soon-to-open Ultra Marinos store will offer cooking classes. Presilla is writing a giant book on Latin American cuisine; it follows her 2001 The New Taste of Chocolate, which focused, presciently, on single-origin beans. At the country’s top environmental-news site, grist.org, “Victual Reality” columnist and food editor Tom Philpott has become a major voice for eco-conscious food lovers (his fans include celebrated author Michael Pollan). But unlike most people who discuss the pros and cons of organics and the question of how to feed the world’s growing population, Philpott has unique insight into these issues: He co-owns and works at Maverick Farms in North Carolina’s Blue Ridge Mountains. By creating candies with ingenious flavors—her truffles might be spiked with curry powder or bee pollen—and packing them in boldly designed boxes, Katrina Markoff has brought high-end chocolate to a new generation. Her Vosges Haut-Chocolat started as a tiny Chicago store 10 years ago; now there are boutiques nationwide, with more coming to Europe, Australia and Japan. Markoff’s dream: Vosges-owned eco-cocoa plantations in South America. Burgundy has replaced Bordeaux as the region of choice for many newly minted wine fanatics—thanks in part to people like Robert Bohr. The wine director at Manhattan’s Cru, home to one of the country’s biggest and best lists, Bohr champions Burgundy with exceptional fervor (in fact, he’s planning to make wine there). Like many wine experts today, he’s a multitasker; his Grand Cru Wine Consulting helps collectors and restaurants build extraordinary cellars. Her ability to open welcoming restaurants in the middle of flashy Los Angeles and her incredible commitment to farmers have made Suzanne Goin (an F&W Best New Chef 1999) the next Alice Waters. Between her Cal-Med Lucques (which inspired one of the top cookbooks of recent years, Sunday Suppers at Lucques) and her wine bar, A.O.C., Goin has given Angelenos hip places to eat amazing, eco-friendly meals. In early 2009, she plans to tackle breakfast, lunch, dinner and take-out at a new place on L.A.’s west side. When he unveiled Momofuku Noodle Bar in 2004, David Chang changed the face of fine dining in New York City by serving outstanding ramen-noodle soup at a casual counter lined with stools; his pork-belly buns became one of the country’s most talked-about dishes. Chang (an F&W Best New Chef 2006) has since built a Momofuku empire in Manhattan with Ssäm Bar and Ko. Next up, the chef will expand Ssäm and add soft-serve ice cream—his secret passion. Making cocktails with fresh fruit and juice was practically unheard of in New York City in the ’90s, when Julie Reiner began mixing drinks there. Her glamorous Flatiron Lounge, launched in 2003, became one of the first places in town to focus only on handcrafted cocktails. At her new Clover Club in Brooklyn, Reiner has taken a huge step in showing that mixologists, like restaurateurs, can preside over multiple venues; in fact, Reiner describes herself as a “bar-ateur” and has plans to open even more cocktail spots. If there’s one person leading the charge against overextracted wines in America, it’s Wells Guthrie. The elegant, complex Syrahs he started making at Sonoma’s Copain in 1999 have garnered raves from people like critic Robert M. Parker, Jr. Guthrie, who worked under two of wine’s superstars, France’s Michel Chapoutier and California’s Helen Turley, also bolstered the trend of using grapes from outside Napa and Sonoma, specifically Mendocino.